La Fumée [Arabie] is the first in a series of limited edition fragrances inspired by the iconic scent of La Fumée. Created in celebration of the rich beauty and magic of the Arabic cultures, La Fumée Arabie is a sensual oriental fragrance centred around the exotic woods of the Middle East. Incense and precious agar wood (oud) encircle dry and sensual woods in this dramatic arrangement of spice, smoke and wood. Opening notes of cistus absolute, cardamom from Guatemala, coriander seed and Egyptian cumin are combined with a smoky heart of incense from the Yemen, Moroccan cedar and birch tar. The final impression is one of smouldered embers, agar wood, rose oil and rich vanilla. The fragrance is presented a glass bottle bearing the signature Miller Harris botanical design printed in 23 carat liquid gold. 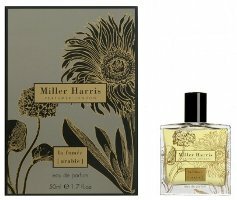 Miller Harris La Fumée [Arabie] is £110 for 50 ml Eau de Parfum. If I were rewriting this copy for the Prix au Faux, I’d be tempted to add “whiffs of freedom and oppression” in there somewhere! I guess Morocco hasn’t had a revolt, yet. . .
Hard for me not to associate the region with the changes happening there right now, in any case. I *think* (I ought to check to be sure) that I’ve only used the tag when they put the word oud in the title of the fragrance, not on every fragrance that has oud. I do like oud, just sick of it being the sole marketing point of half the fragrances on the market! And they managed to *not* name oud in the first paragraph — that’s an improvement! Ah! I guess I didn’t catch that distinction! Thanks for clarifying! I can see how a person could be ok with the note and not with the hype. Since I’m late to that party (oud had already flooded the market by the time I found my way here to NST and perfumista-hood), it doesn’t hold the same eye-rolling powers in any case! Morrocco has not had a change in government, but there have been changes in response to protests for more freedom. Uh, yeah! That made me laugh too. This is just further evidence as far as I’m concerned that La Fumee is the old Matthew Williamson Incense which could justifiably be described as iconic. LOL…excellent story! And thanks, good to know. If I buy more than a sample, though, I think I’d have to go for a decant — I wonder how much of the hefty price tag is due to the 23K liquid gold frippery? Yes, I’d rather skip the frippery & have a lower price too. But if they’re marketing this to the Middle East, as I suspect they are, a higher price tag is almost a selling point. That did cross my mind. And at any rate, I’m sure the bottle looks lovely. I haven’t even gotten around to sniffing the enticing-sounding original yet, so this news is making me CRANKY!